Phase Three (Part 1) is available to read here. 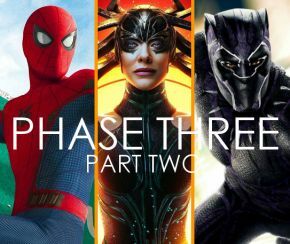 The first half of Phase Three had taken the Marvel Cinematic Universe (MCU) beyond what was possible, with stories about the heroes falling apart and journeys across the multiverse. Marvel TV was moving ahead with multiple new franchises such as The Punisher on Netflix, which continued the violent story of Frank Castle from the second season of Daredevil, the underwhelming Inhumans, and the upcoming Runaways and Cloak & Dagger. Now in this article, we are near the end of our journey on the road to Infinity War, but first we have three more stops along the way, and the first is a trip back to high school. After both of his previous film series came to an end, Sony pictures were unsure of which way to turn for the future of the web-slinger. Both series tried to condense too many villains and sub-plots into their final instalments and the stories suffered because of it. Fortunately, Marvel Studios was at hand to guide them in the right direction and a deal was struck. Set two months after the events of Captain America: Civil War, Peter Parker is back in Queens, eager to get back to work with the rest of the Avengers and his sort-of mentor Iron Man. But when a new villain appears, he gets the chance to prove himself a hero. Tom Holland’s Spidey is just what the audience needed, a youthful and excited superhero doing what he can for the little guy, in between high school and pining for his crush Liz. The story takes the character back to basics in the vein of a John Hughes high school movie, and it’s all the better for it. Like the previous Spidey films, the movie features three villains, but in this case the story works, with all three working together with the same backstory. The villains are the Tinkerer, Shocker, and the main antagonist of the piece: the Vulture. Taking place in a post-Avengers world, there are plenty of references to the previous instalments, including a gang of bank robbers wearing Avenger masks, Captain America’s hilarious school video lessons, and of course, technology recovered from the Avengers many missions. It’s an inspired idea, taking the leftovers from the previous films and doing something new with them, such as the gauntlet that Crossbones loses in Civil War, being altered by Michael Chernus’s Tinkerer to create the Shocker’s zapper. Former Batman, Michael Keaton, stars as the vicious Adrian Toomes aka the Vulture. After losing his job because of Tony Stark’s clean up company Damage Control, Toomes begins to scavenge for technology that the Tinkerer can use to sell to criminals. It’s not just the villains who get new technology. After his encounter with Iron Man, Peter now has a new high-tech suit with a few surprises, such as his iconic web-wings, multiple web-shooter options, and an A.I. software similar to JARVIS, who Peter names Karen, voiced by Paul Bettany’s real life partner Jennifer Connolly. There’s a whole host of other characters that get a good amount of screen time including Jon Favreau’s Happy Hogan, who has to reluctantly maintain contact with Peter, and Marissa Tomei’s younger incarnation of Aunt May. We also meet Peter’s high school colleagues, from best friend Ned, played by Jacob Batalon, his bully Flash, played by Toni Revolori, and The Greatest Showman’s Zendaya as the sarcastic Michelle. Since this expands on what happened after Civil War, Peter has regular contact with Tony Stark/Iron Man, who helps him out when things get out of hand. But after an incident with a ferry, Tony takes the Spidey suit away after Peter insists he is nothing without it. We also get to meet Donald Glover’s Aaron Davis, who in the comics is known as the Prowler. There is even a small reference where he takes an interest in a set of climbing gauntlets. The Prowler is a career criminal, and also happens to be the uncle of Miles Morales, the Spider-Man of the Ultimate comic series, who is briefly mentioned in the film and will star in the upcoming animated movie Spider-Man: Into the Spider-Verse, and will actually be voiced by Glover himself. Spider-Man: Homecoming has become one of the best Spider-Man films ever created and leaves a lasting impression on the audience. Now Marvel had to catch up with one of the oldest Avengers who had still yet to appear in Phase Three. His first two films didn’t quite cause the storm we were promised, but luckily New Zealand director Taika Waititi was at hand to restore the faith, with a much more comedic third and final instalment to the Thor franchise. Thor: Ragnarok sees the God of Thunder being stranded on the planet Sakaar after trying to find his father Odin, and must find a way to return to Asgard and reclaim the throne from the ruthless Goddess of Death, Hela. With his trusty hammer Mjolnir now gone, Thor finds himself imprisoned and forced to compete in a gladiatorial contest of champions, presided over by the Grandmaster, played with delight by Jeff Goldblum. The movie acts as the final part of Thor’s character arc, with him fulfilling his destiny by becoming the King of Asgard, as well as discovering just how powerful he can be as the God of Thunder. This addition arguably is the best Thor movie to date, with some of the best action sequences and character development, including a fantastic villain. Aussie Cate Blanchett stars as Hela, a powerful ruler who can summon the dead to her bidding, who desires her rightful place on the Throne and to expand the kingdom beyond the nine realms, with the help of Karl Urban’s Skurge the Executioner and her gigantic pet Fenris wolf. Up until this point in the timeline, the audience was wondering what had happened to another member of the original Avengers, who was absent for the events of Captain America: Civil War. The Incredible Hulk finally returned, quite literally, with a bang. Although Thor is absolutely delighted to see his old friend again, Hulk isn’t in the mood for a chit-chat and proceeds to challenge the God of Thunder to a long overdue rematch, much to the applause of his fans. The film acts as a loose adaptation of the famous Planet Hulk storyline and even includes two of the main characters, Korg, played by Taika Waititi, and Meik. Both have a great part to play and Korg quickly steals the show with some hilarious scenes. Mark Ruffalo once again appears as Banner and becomes a member of Thor’s little team he refers to as the ‘Revengers’, alongside Tessa Thompson’s hard-drinking Valkyrie and Tom Hiddleston’s Loki, in an attempt to escape from the planet and save Asgard. Valkyrie is the last surviving member of a fierce team of female warriors from Valhalla, after a clash with Hela years ago, when she decided to take over the kingdom. She’s a great character and will be a good ally in the battle against Thanos in Infinity War. We finally got to see one of the nine realms that had been teased in Thor: The Dark World, and that world is the fiery Muspelheim, the Land of Surtur, who is destined to bring about Ragnarok. Surtur was brought to life with the combination of Taika Waititi providing the motion capture, and the voice of Clancy Brown. We even get a small cameo from the Master of the Mystic Arts himself, Doctor Strange, when Thor pays a visit to the Sanctum Sanctorum in New York on his search for Odin. It’s a great sequence that leaves us wanting more interactions between them in the future. Even though we dove into Norse history and lore, it is unlikely that we will see the rest of the nine realms after Thor’s trilogy came to a close, unless we see characters like Valkyrie or fan-favourite Beta Rey Bill in their own adventures. The mid credit scene features Thor and Loki staring out to space aboard their ship, as a large craft descends into their view. It has since been revealed that this is actually Thanos’s ship, beginning or during his quest for the six Infinity Stones. Thor: Ragnarok is the last film to explore the cosmos before we return to Earth to catch up with the new King of Wakanda, in the last step of our journey towards Avengers: Infinity War. After his outstanding debut in Captain America: Civil War, T’Challa the Black Panther was back with his long overdue solo movie, and it didn’t disappoint. Chadwick Boseman returned as the titular character on the verge of becoming the king of the reclusive and highly advanced African nation of Wakanda. He comes under challenge from multiple fractions from his own country and two foes determined to bring Wakanda into a new world war. Wakanda had been teased several times over the course of the MCU, with an Easter egg in Iron Man 2 and the full unveil in Captain America: Civil War, but this time, we get to see it in all its glory. Forged thousands of years ago by a meteor made of Vibranium, the same element in Captain America’s shield, Wakanda hid from the outside world and advanced their technology way beyond what the rest of humanity has achieved. One of the things we learn is the secret to Black Panther’s strength, a rare heart-shaped herb that only grows in Wakanda. It increases the consumer’s strength and briefly allows them to visit the ancestral plane, where they can meet deceased family members. There are plenty of side characters who have important roles to play, chief among them is T’Challa’s little sister Shuri, played by Letitia Wright. She is one of Wakanda’s leading scientists and helps to create all of the technology used throughout the film, including the new kinetic Black Panther suit. One of the biggest parts of the film is the Dora Milaje, a team of all-female bodyguards, led by Okoye, played by Danai Gurira. We also meet Lupita Nyong’o’s Nakia, a spy and also T’Challa’s ex. They have some incredible action scenes and share a great amount of screen time with T’Challa. Michael B Jordan appears as Erik Killmonger, a violent ex-soldier and heir to the throne, who attempts to overthrow T’Challa and gain the power of the Black Panther. Killmonger is arguably one of the best villains so far. His motivations are clear and relatable, but his ruthless nature prevents him from being a likeable character. Andy Serkis made his glorious return as Ulysses Klaue, now armed with a sonic canon disguised as his missing lim. Although it was previously thought that Klaue would be the main antagonist, however, he is working with Killmonger who decides to cut his ties with Klaue and head towards Wakanda. There are several other parties with their own agendas, chief among them is M’Baku played by Winston Duke. To fans of the comics, he is known as Man-Ape, and his movie costume honours this with fur shoulders on his armour and a gorilla mask he wears in an early battle. M’Baku is the leader of the Jabari tribe and attempts to claim the throne for himself by challenging T’Challa as part of his leadership ritual. The film explores what it means to be a king by putting T’Challa in difficult situations, which he must take responsibility for, proving that it is hard for a good man to be king. Killmonger is a good king, being able to make harsh decisions and dealing with the consequences, but a truly bad man that was scarred by his life experiences. The film culminates in an epic showdown between the forces that stand with and against Killmonger. Wakanda erupts into a battleground, which it is set to do again in Infinity War, complete with high tech weapons and aggressive rhinos. Black Panther has gone on to become one of the highest grossing films of all time and a great stepping stone on the path to diverse representation in Hollywood. The post-credit scene shows Bucky Barnes, who the children refer to as White Wolf, awakening after being helped by Shuri. It isn’t clear whether he truly has been cured or not, but at least, for the time being, he has a moment of peace. Well, we have come to the end of our journey, spanning ten years and eighteen movies, culminating in the event of the decade, Avengers: Infinity War. This journey has taken us from the back alleys of New York to the far reaches of the cosmos and beyond. We have met billionaires and gods and everything in between and it’s been fun doing so. Infinity War marks the end of the road for the MCU as we know it, but we cannot forget what to expect in the future, including Ant-Man and the Wasp (2018), the eagerly awaited Captain Marvel (2019), and the still untitled Avengers Four (2019). Marvel Studios has proven to be a force to be reckoned with and there seems to be no signs of slowing down. With over twenty more movies planned post Avengers Four, including Guardians of the Galaxy Vol. 3, Spider-Man: Homecoming 2 as well as the long awaited Black Widow solo feature. There is so much more to be excited about. Marvel’s Avengers: Infinity War will be released on 26th April.